CHICAGO (WLS) -- With the start of the New Year always comes a new set of laws to obey. 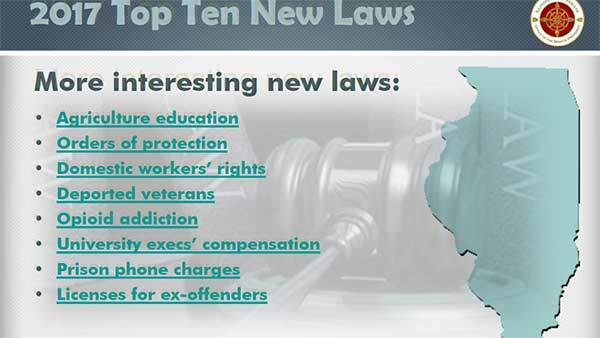 Check out the top 10 new laws for 2017 above, and the full list of new laws below. January 1 is the effective date for almost 200 new state laws passed by the General Assembly and signed by the governor in 2016. The Senate Democrats have published their top ten list for 2017. Laws make the list based on their importance to the public and how broadly they affect key issues such as safety, ethics, workers' wages and benefits, and criminal justice reform, the Senate Democrats said. VIDEO: the New Year means new laws, and in 2017, many of them have to do with the rules of the road. 2017 brings in a new law that expands an existing one. In 2016, drivers were required to change lanes or slow down for a stationary emergency vehicle. But in 2017, that law applies to all stranded vehicles with hazards on. "We've had a lot of our own troopers that have been seriously injured or killed in line of duty as a result of people failing to move over. We also number of disabled vehicles and drivers killed every year for the same reason," said Master Sgt. Jason Bradley, Illinois State Police. Also on the books for next year are stiffer penalties for people caught driving without insurance. A new 2017 law allows officers to impound and possibly seize a vehicle if a driver has been convicted of driving without insurance and is caught again within a 12-month period. Previously, the car was only towed. The ABC7 morning news team tests their knowledge of new Illinois laws. In addition, Illinois State Police remind motorists about a law new to 2017 that increases penalties for speeding in construction and school zones. "If you are speeding 26-34 miles an hour over in construction zones, that is a Class B misdemeanor, or 35 miles in a construction or school zone - both are jail-able offenses," Bradley said. Fines will double for failing to stop at a railroad crossing - $500 for a first violation, $1,000 for a second. 2017 will also cost you more to park in Chicago - over 750 new parking meters will be installed throughout the city. 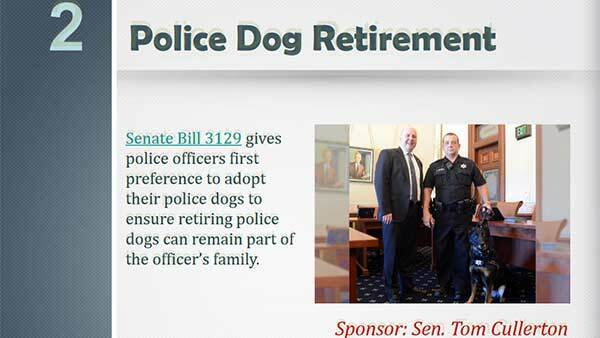 VIDEO: The New Year means new laws are taking effect. In Illinois, many of them are focused on women. A first-of-its-kind law in Illinois will mandate training for cosmetologists when they renew their licenses. 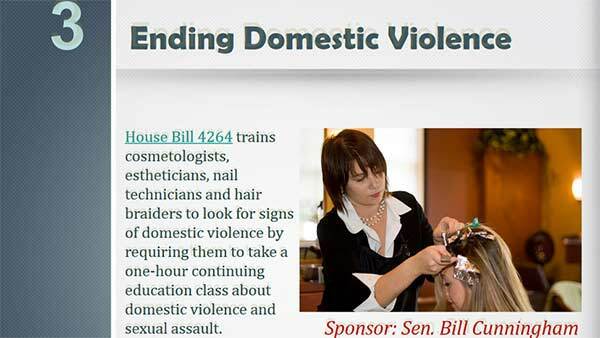 "This training will help them recognize signs of domestic violence, but most importantly give them the tools they need to put victims in touch with services," said State Sen. Bill Cunningham, (D) Beverly. Cunningham says domestic violence advocacy groups will provide the training free of charge. "I think one thing we recognize in the Senate is there is this sort of unintentional discriminatory affect to a lot of laws that work against women. Sometimes it comes up in the way we impose sales tax," Cunningham said. For example, feminine hygiene products were being taxed at the same rate as "luxury" products. 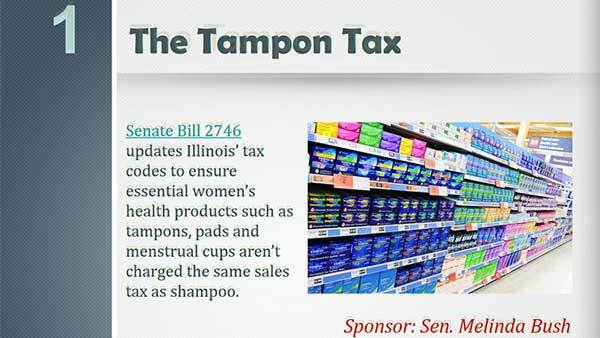 A new law repealing the "tampon tax" changes that, so feminine products will now be taxed at the same rate as necessity products like shampoo. 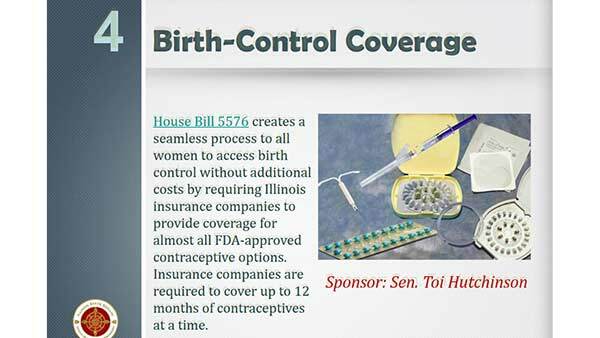 In addition, a new 2017 law requires all insurance companies to provide birth control coverage for up to 12 months at a time. A new law also requires employers to allow workers to take up to half of their sick time to care for sick family members. SB 2787	Requires that health carriers submit reports to Director of Insurance by June 1 instead of March 1. 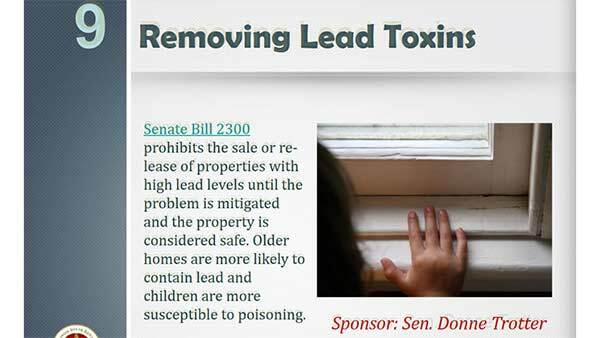 SB 2813 Amends Coal Mining Act. Adds definition for recorder. Makes changes concerning mine examinations, including timing and scope, etc. SB 2918	Provides that if specified notice is submitted then an employer may request that the unused portion of a terminated licensee's pesticide applicator or operator license term be transferred to a newly certified or re-certified individual. HB 5593	Substance abuse programs licensed by DHS must provide educational info on opioid treatment options, including use of medication for opioid addiction and overdose, how to administer naloxone. HB 5602	"Changes the Nursing Home Care Act; if DPH fails to provide a written explanation as to why evidence was insufficient to refute a informal dispute resolution (IDR) finding the receipt will be cited for the dispute and no penalty can be imposed"
SB 2900	Expands the role of Physician Assistants ("PAs") and Advance Practice Nurses ("APNs") throughout various Acts, by allowing them to perform many duties, or hold positions normally reserved only for physicians or those similarly situated. during a renewal cycle, the teacher may carry over any hours earned from April 1 to June 30 of the last year of the renewal cycle"
HB 5696	Defines "acceptable technological means"
SB 3301 Requires all courses approved for Illinois Articulation Initiative Gen Ed. Codes must be transferable as part of the Gen. Ed. Core Curriculum Package. HB 5566	"Expands P-20 Council's duties to make higher education affordable. HB 5933	Removes provisions giving the Local Food, Farms, and Jobs Council responsibility to develop, in collaboration with the Department of Agriculture, a label and certification program. SB 2805	Adds two members to the Illinois Electronic Recording Commission. HB 1437	Requires the Illinois Criminal Justice Information Authority toreport the number of persons arrested and released without charging, and the racial and ethnic composition of those persons. 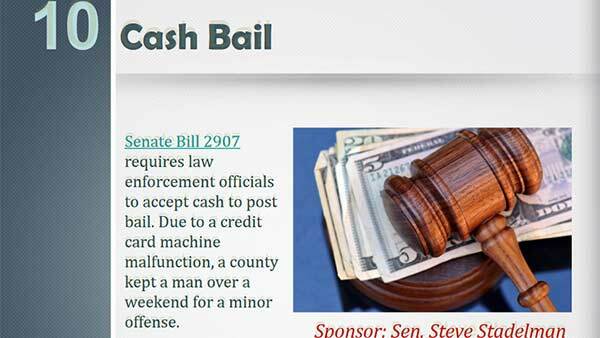 HB 5660	Amends Public Construction Bond Act. Provides that verified notice shall be deemed filed on the date personal services occurs or the date when (rather than where) the verified notice is mailed. HB 6006	Requires vehicles to change lanes when coming up on a car with its hazard lights on. HB 6060	Adds the percentage of Medicaid funded residents as a factor that DHFS must consider for purposes of payment in nursing home facilities. 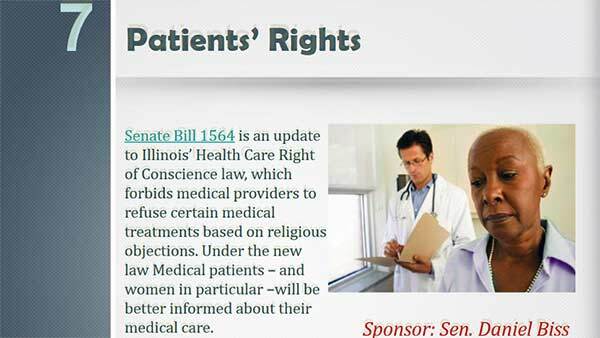 SB 1564	Health Care Right of Conscience law. Ensures patients receive information about treatment options, regardless of medical provider's religious beliefs. SB 2743 Bars yoga teacher training from state regulation as a business. HB 6226	Allows local governments to consult a highway design publication outside of IDOT's bureau of local roads and streets manual. HB 6245	"Removes the restriction that managing brokers and brokers can earn no more than 6 hours of continuing education credit in one calendar day. SB 2906	Requires DHS to treat high school participation as core activities for TANF recipients. SB 2972	Allows retirees to choose separation benefits rather than retirement annuities if they would be less than $100 per month. 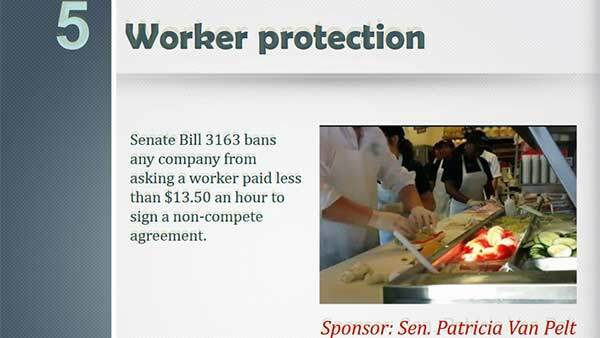 HB 3554	"Amends the Illinois Wage Payment and Collection Act regarding departmental wage recovery; remittance to aggrieved employee." HB 3898	The bill provides that the intended parent is the legal parent of any resulting child and may seek a court order confirming the existence of a parent-child relationship. Currently, without these clarifying provisions, children who are born of assisted reproductive may be the subject of legal disputes over who has parental rights and obligations. HB 4576	Creates the Rare Disease Commission act, and requires that Commission to meet at least once annually and submit an annual report to the General Assembly. SFA #2 clarifies by stating the Commission must coordinate with the Genetic and Metabolic Disease Advisory committee. Sets a sunset for commission of 1/1/2020. SB 2875	A court may grant law enforcement's request for location surveillance information through testimony made through electronic means between requestor and judge if there is clear and present danger from imminent use of force, kidnapping, or occupation of any premises or hijacking of a vehicle. Police may seek location info in case of an escapee. HB 5538	Law enforcement agencies shall develop arrest procedure policies for domestic violence situations, with training for new recruits and every five years. HB 6149	New universal specialty license plate for Illinois Veterans' Homes. HB 5924	Amends Probate Act. Unless court order to the contrary, guardian shall use reasonable efforts to notify the ward's known adult children, who have requested notification and provided contact information, of the ward's admission to a hospital or hospice program, the ward's death, and the arrangements for the disposition of the ward's remains. HB 4257	DHS shall issue upon request a card certifying that the holder has been diagnosed with an autism spectrum disorder. Allows for collection of associated fee not to exceed $10. 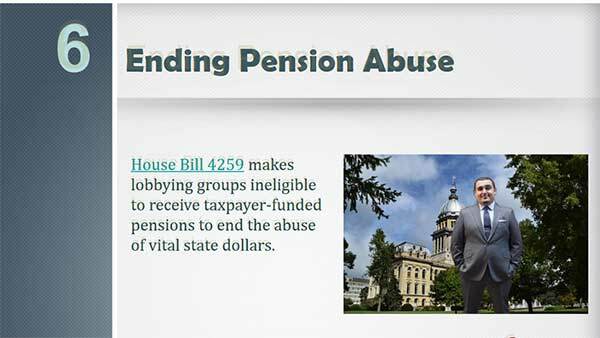 HB 4259	prohibits members of certain organizations from being considered an employee for purposes of collecting a pension benefit through IMRF, SURS or TRS. HB 4590	Adds to list of adoption disclosures: reasons the birth parents stated for placing the child for adoption; how and why the adoptive parents were selected and who selected them; and whether the birth parents requested or agreed to post-adoption contact with the child at the time of placement, and, if so, the frequency and type of contact. HB 5656	Requires DCFS to make reasonable efforts and accommodations to grant visitation privileges to a non-custodial grandparent or great-grandparent of a child who is in the care and custody of the Department. 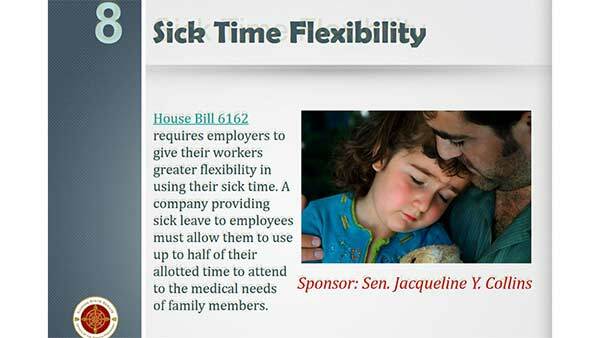 HB 6162	Allows employees to use personal sick leave benefits for absences due to an illness, injury, or medical appointment of an employees direct family members. SB 2393 Requires districts to offer breakfast after the bell at schools with 70 percent low-income students. HB 4604	Changes the name of the fee from "Public Hunting Grounds for Pheasants" to "Public Hunting Grounds for Game Birds". HB 4515	Allows health care companies to hire someone convicted of certain crimes if that person has obtained a wavier from the Dept. of Public Health. HB 5771	Certain mandatory natural life sentencing provisions for criminal sexual assault, aggravated criminal sexual assault, and predatory criminal sexual assault of a child apply only to a person who has attained the age of 18 years at the time of the commission of the offense. HB 6291	Requires that a minor is not committed to the Dept. of Juvenile Justice for certain controlled substances violations unless its their third or subsequent judicial finding of a probation violation. SB 2804	Allows employees to revoke a wage assignment at any time by submitting written notice to a creditor. SB 2989 Application forms for winery shipper's license shall include all addresses from which applicant intends to ship wine, including third-party manufacturers. Licensee must include certain disclosures in application. Third-party providers must file with Liquor Control Commission, cannot appoint third-party provider that is in violation of law.